Keith can be found most Friday lunchtimes exhibiting his prints in ‘The Racehorse Inn’, Catworth, as a convenient place to meet base employees and the general public. Keith’s involvement with RAF Molesworth and the surrounding bases has been long standing since he began his art career. Using his wealth of military history knowledge, Keith has given presentations to new personnel, in order to explain the historical importance of where they work during WWII. 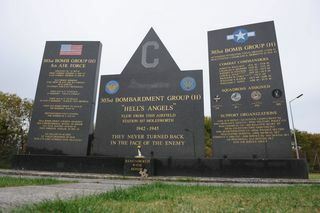 The links between the base and the local area are never more clear than when observing the 303rd Bomb Group Memorial that stands in the entrance to RAF Molesworth, which “especially honours the 841 young Americans who last trod the Earth in this part of Cambridgeshire, England”. Keith’s work hangs in most buildings on base, and depicts many of the 303rd Bomb Group missions undertaken from Molesworth as well as more recent campaigns the base has been involved in. Keith is well known on base, supporting their annual Hanger Dance and Bazaar, as well as making donations to the silent auctions at annual Joint Service Ball’s to which he is honoured to be asked to attend. Whilst most of the paintings are researched and planned for by Keith, he is often approached by current personnel with their own experiences or ideas, whether it be as an official commission or as inspiration for a painting and a limited edition of prints. Click here for more information and to see the range of prints available with links to local US Bases. Keith’s work can be seen hanging in military establishments throughout the world including the Pentagon and Ministry of Defence. His work has appeared on magazine covers as well as being featured in leading aviation and military publications. 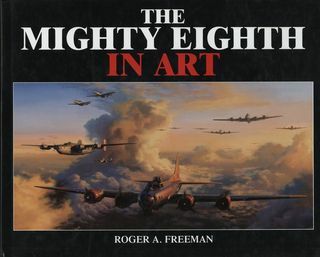 Four of his paintings were included in Roger Freeman’s book, ‘The Mighty 8th in Art’. In 1984 Keith started work on his ‘8th Air Force Collection’. This is a collection of sixty-one paintings, representing each of the 8th Air Force combat units that flew from England during WWII, and which are now on permanent loan to the prestigious ‘Mighty 8th Heritage Museum’ in Savannah, Georgia. A collection of reproductions of the paintings hangs in the E.A.A. ‘Eagle Hanger’ Oshkosh, Wisconsin. For his work in “helping to perpetuate the memory of the 8th Air Force” he was appointed ‘Official Artist’ to the ‘8th Air Force Memorial Museum Foundation’ and was invited to exhibit his work at the 8th Air Force reunion 1991 in Las Vegas that was attended by over 2000 veterans. In 1992 Keith had the privilege of being commissioned by the U.S. Air Force, to paint the incidents for which the only five ‘enlisted airmen’ have been awarded the ‘Medal of Honor’. Today the paintings hang in the ‘Enlisted Heritage Hall’ Gunther Air Force Base, Alabama. A sixth painting was commissioned in the Medal of Honor series by ‘The Elmenorf PME Center’, Elmendorf AFB, Alaska in recent years. A seventh painting in the series is currently a work in progress. Click here for more information and to view the ‘Medal of Honor Collection’.